Aric Almirola and the No. 10 Mobil 1 Ford Fusion team wrapped up the three-race “NASCAR Goes West” swing Sunday at Auto Club Speedway in Fontana, California with a 12th-place finish for Stewart-Haas Racing (SHR). Three of the four SHR entries finished in the top-15 at Fontana – the lone exception being Kevin Harvick, who was involved in an accident – continuing the show of strength by the four-car entity five races into the 36-race Monster Energy NASCAR Cup Series season. The strong start for the Ford-backed team has placed all four cars in the top-11 in the driver point standings – Harvick in eighth, Clint Bowyer ninth, Almirola 10th and Kurt Busch 11th. This weekend, NASCAR’s premiere series heads to a completely different style of track. Martinsville (Va.) Speedway is known for its unique surface with racecars competing in very tight quarters, creating exciting racing for the fans. Tempers often flair as drivers vie for one of the most coveted trophies on the circuit – a hand-crafted grandfather clock. Almirola hits career milestone Cup Series start No. 250 this weekend at Martinsville. The toughness of the sport doesn’t allow for many drivers to stick around long enough to make it to their 250th start. Almirola first competed in the Cup Series in 2007 as a part-time driver. While the 34-year-old has enjoyed recent success at SHR, he knows it doesn’t come easily. If the current Almirola could give advice to his younger self, it’s interesting what he would say. Almirola eyes this weekend’s event as another opportunity to continue building his relationship with crew chief Johnny Klausmeier and the No. 10 Mobil 1 team. Klausmeier’s alma mater, University of Maryland-Baltimore County, enjoyed success last weekend in the opening rounds of the NCAA March Madness basketball tournament. The relatively unknown school took front and center on the national stage after routing No. 1 seed University of Virginia to move on to the second round, where it was eliminated by Kansas State. This weekend’s Martinsville event marks the first two-day show of the season for the Cup Series. The condensed schedule means one less practice session for the premiere series as track activity doesn’t begin until Saturday morning. While most people are familiar with Almirola piloting the white, black and gold Smithfield Ford Fusion this weekend, the No. 10 machine will dawn the Mobil 1 colors of red, blue, and white. 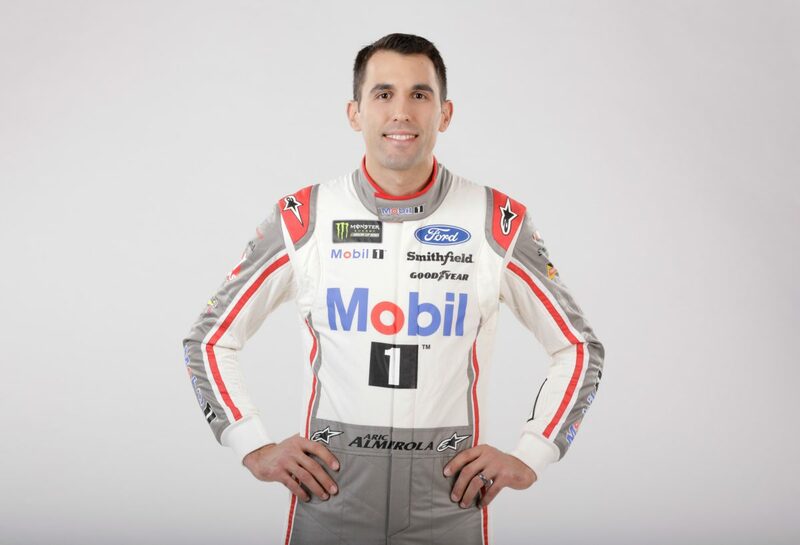 The longtime SHR partner is also the “Official Motor Oil of NASCAR,” and the partnership with Mobil 1 continues to provide a rigorous and extreme testing ground to improve lubricant technology performance on and off the track. Statistically, the half-mile, paperclip-shaped Martinsville oval has been one of Almirola’s better tracks. He’s earned one top-five finish and three top-10s with 2012 being his best season at the track with finishes of eighth and fourth. He’s also led a total of 56 laps at the Virginia track and has an average starting position of 20.7 with an average finishing position of 22.4. This weekend in the Cup Series at Martinsville, the native of Tampa, Florida will make his 19th start in the series. In Almirola’s NASCAR Camping World Truck Series career at Martinsville, he has an average starting positon of 12.0 and an average finishing position of 11.4. To this point in the season, Almirola has completed 1,308 laps in five Cup Series events for a completion rate of 99.8 percent. Coming off five top-13 finishes – 11th at Daytona (Fla.) International Speedway, 13th at Atlanta Motor Speedway, 10th at Las Vegas Motor Speedway, seventh at ISM Raceway near Phoenix and 12th at Fontana – Almirola and the No. 10 team have proven their competitiveness at several styles of tracks – a superspeedway, two intermediate ovals, a short track and a fast, 2-mile oval. Martinsville serves as the final race before the first NASCAR Cup Series off weekend. The series returns to action April 8 at Texas Motor Speedway in Fort Worth. Almirola and the No. 10 team have already visited the 1.5-mile track once, before the season officially started for a two-day test Jan. 9 and 10. It marked the first time the Klausmeier-led team worked together. How much are you looking forward to going to Martinsville, the first real short track of the season? What do you have to get right at Martinsville to be successful? Can you describe how difficult pit road is at Martinsville, especially coming off of pit road when drivers are playing games with each other? When you were growing up, did you ever think you’d be at this point in your career with 250 Cup Series starts?